Educators Superbugs M - That's Sick! The advent of antibiotics in the early 20th century transformed therapy saving and continuing to save millions of lives globally and in the US. The flip side of this revolutionary treatment has been the development of antibiotic-resistant pathogens (superbugs) that have caused havoc worldwide and most notably in hospital settings. Examples of such superbugs include multidrug-resistant tuberculosis and methicillin-resistant Staphylococcus aureus. These superbugs have created a critical situation for public health and our public health laboratory scientists work diligently to determine antibiotic resistance patterns so that doctors can administer effective treatments and prevent the spread of antibiotic resistance. The discovery of antibiotics in the early 20th century transformed human medicine. Antibiotics now save millions of lives each year in the US and around the world. There are many resistant bacterial, viral, parasitic and fungal organisms. 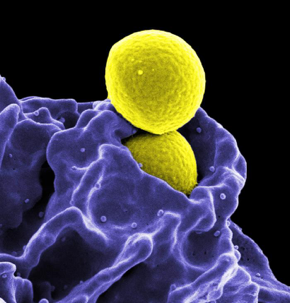 The rise of antibiotic-resistant bacterial strains has become a growing problem especially with diseases like tuberculosis, as well as MRSA (methicillin-resistant Staphylococcus aureus), and Infectious Diseases (NIAID), CRE (carbapenem-resistant Enterobacteriaceae) and other bacteria which spread easily in hospitals (Healthcare-associated infections) These organisms, which are resistant to common antibiotics, are often referred to as superbugs and represent a serious threat to public health. Antibiotic-resistant bacteria cause an estimated two million illnesses and 23,000 deaths each year in the US. As more strains of bacteria become resistant to the available antibiotics, our treatment choices will become increasingly limited and, in some cases, nonexistent. Public health laboratory scientists work hard to combat the spread of antibiotic resistance by conducting antimicrobial susceptibility testing, along with detection of resistance indicators in the bacteria’s DNA, to better inform doctors whether antibiotics can be used and to help prevent the spread of antibiotic resistance. It is important for everyone (YOUNG and OLD) to join the fight against resistant superbugs! 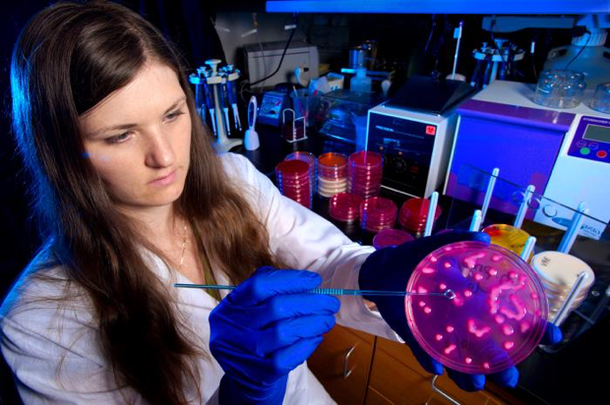 This 2014 image depicts Centers for Disease Control (CDC) laboratorian Alicia Shams, as she was showing viewers a Petri dish culture plate that demonstrated growth of Klebsiella pneumoniae on a growth medium of MacConkey agar. Using an inoculating loop held in her right hand, Ms. Shams was pointing out the bacterial colonies which grew atop the MacConkey medium contained in the Petri dish she held in her left hand. 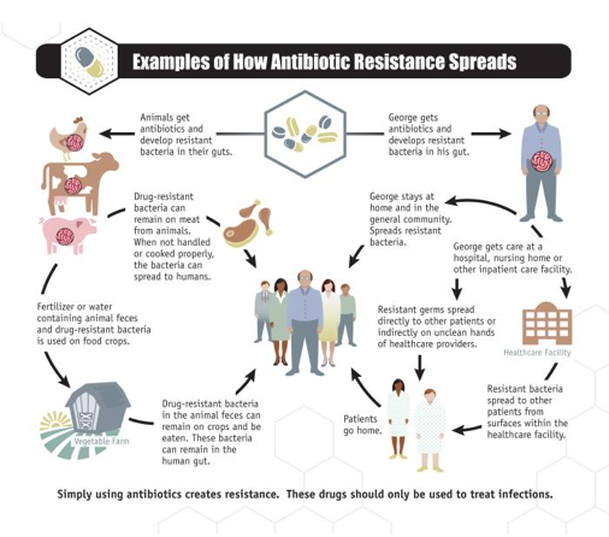 This infographic illustrates in very simple terms, “Examples of How Antibiotic Resistance Spreads”. The take-away message here, is that “simply using antibiotics creates resistance, and that these drugs should only be used to treat infections”. Some of the more deadly hospital associated infections are caused by germs that have developed resistance to common antibiotics and are often referred to as superbugs. This lesson plan describes a simple dice game that illustrates how antibiotic resistant organisms or superbugs remain after antibiotic treatment. This link provides a lesson plan on antibiotic resistance and includes a video, questions, and additional resource links. Public health laboratory scientists are involved in detecting those organisms that are resistant to or developing resistance to available antibiotics. Good hand hygiene is an important step to prevent infection with the influenza virus and other microorganisms. If you are unable to wash your hands with soap and water, decontaminating your hands with hand sanitizer is also a good preventive measure. This lesson plan teaches students how important hand washing or using hand sanitizer is for the removal of infectious agents (germs) such as bacteria, viruses, parasites and fungi. The infectious agents and their removal are demonstrated by using a product called GloGerm. Students learn about agar plates and bacterial growth by making the plates and culturing bacteria from classroom surfaces. Students can also add a drop of hand-sanitizer and look for different results. According to the CDC, more than 9,000 healthcare-associated infections (HAIs) are caused by CRE each year. CRE are a family of germs that are difficult to treat because they have high levels of resistance to antibiotics and can be deadly. This YouTube video clip discusses the CRE superbug. ABC News coverage of CRE likely transmitted to patients by contaminated medical scopes at UCLA’s Ronald Reagan Medical Center exposing 180 people. This is a short (10:00) SciShow video describing bacteria, the development of antibiotics, and the evolution of super bugs. While the presenter will certainly appeal to middle school students themselves, the content is more appropriate for the teacher to use as a resource. This website includes a description of what antimicrobial resistance is, how it can be spread and examples of disease causing microbes. Easy to read summary tables, examples and questions and answers are included. This link provides a comprehensive description of the threat of antimicrobial resistance, how it can be prevented and the current threat sorted by threat levels: Urgent, Serious, and Concerning. This guide gives a brief overview of HAIs, including what they are, how they are caused, how they can be prevented and the role of different health care personnel in their prevention, including microbiologists on page 11. Many public health laboratory scientists are microbiologists. Oregon AWARE, a program of the Oregon Public Health Division, partners with educators and childcare providers to help students and their families have a better understanding of basic disease prevention, appropriate antibiotic use and how they can avoid antibiotic resistance. This is a short article that briefly explores the anti-bacterial properties of clay.